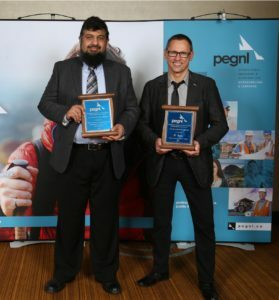 The Professional Engineers & Geoscientists Newfoundland and Labrador (PEGNL) has jointly honoured C‑CORE and the Water Resources Management Division (WRDC) of Newfoundland and Labrador’s Department of Environment and Conservation with its Environment Award for 2018. Presented for applying engineering or geoscience principles to protect or enhance Newfoundland and Labrador’s environment, the award recognizes CCORE’s Earth Observation (EO) team (Pamela Burke, Jerry English, Mark Howell, Mike Lynch, Thomas Puestow and Sherry Warren) and Dr. Amir Ali Khan of WRMD for developing the innovative River Ice Monitoring Service. In response to the severe and unanticipated flooding of the town of Badger (located on the Exploits River in Central Newfoundland) in February 2003, Dr. Khan approached C-CORE to develop a pilot program for monitoring ice conditions on the Exploits River with the aim of providing more and better inputs to WRMD’s flood prediction model. At the time, volunteer observation/data collection at a few points along the river and helicopter fly-overs were the only available monitoring options. The former was limited by remoteness and accessibility, as well as potentially risky for volunteers; the latter was limited by cost. Working in collaboration with WRMD, C-CORE’s EO team set to work on a better solution. Together, they created the first satellite-based river ice monitoring service in the world. Using satellite radar imagery, the team developed methods for identifying river ice features in satellite radar imagery: the type of ice and location of the ice front, as well as changes. Satellite monitoring proved to be more comprehensive and cost effective than previous methods, since radar images provide wide-area view; twice-daily observations as needed; and ability to see through darkness, cloud and most weathers. By providing more precise and comprehensive data more frequently, C‑CORE greatly improved the accuracy of Badger’s flood forecast and its citizens’ ability to prepare for and respond to a flood. Since this highly successful pilot, monitoring of the Exploits River has continued annually between December and March. C-CORE’s River Ice Monitoring Service has been used across Canada, in the United States and in Russia. For a demonstration of our River Ice Monitoring Service, visit our Service Portal here. The award was received on June 7th by the individuals who conceived, developed and piloted the project together: Thomas Puestow, C-CORE’s Director of Earth Observation, and Dr. Amir Ali Khan of WRMD.